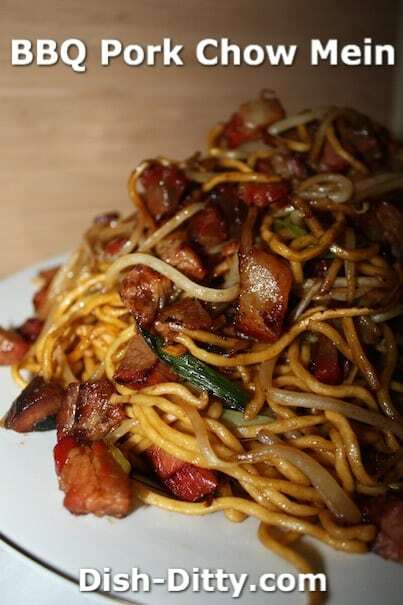 I just love BBQ Pork Chow Mein and it definitely is an american favorite at Chinese Restaurants around the nation. This is a simple dish to prepare and is a great one-dish meal, especially for lunch. 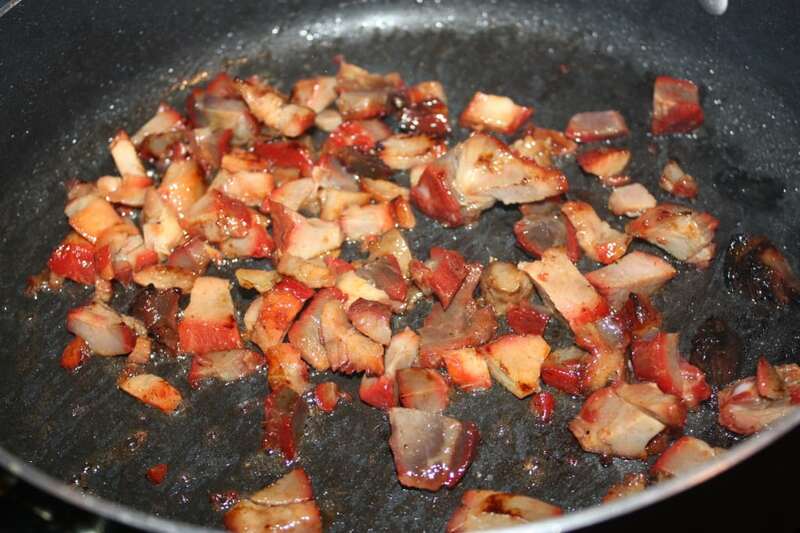 This recipe is designed for BBQ pork, so substituting other meats may not work unless you marinade the meat appropriately and cook it well before adding the vegetables. But, if you are looking for an adaptable recipe for uncooked meat, try our Chicken Chow Mein recipe. Now, onto the show, here’s the recipe. Enjoy! Wash & cut up your vegetables. I chose just bean sprouts and green onions. In a small bowl, combine the soy sauce, lo mein sauce and wine. You can substitute rice wine vinegar if you are alcohol-free. 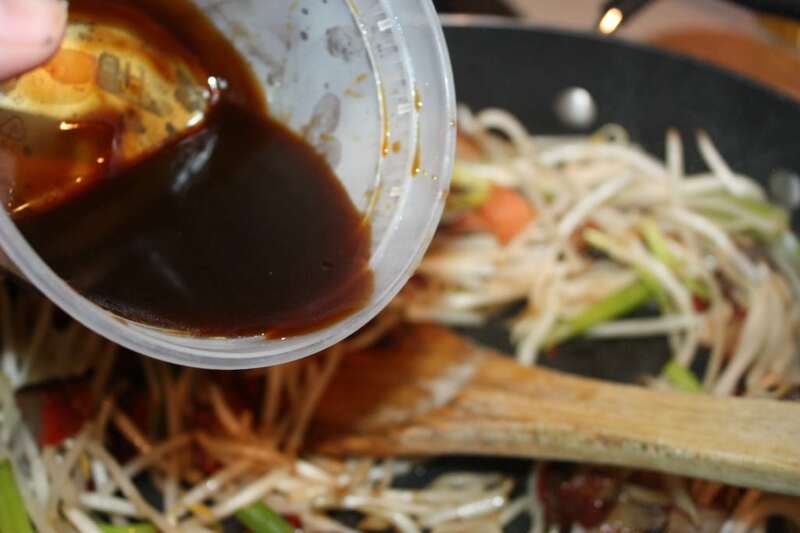 In a large wok or pan, heat on high. Add the vegetable oil and the diced BBQ Pork. Cook until pork is hot and starting to get light brown (don't cook so much that it gets completely brown, just a hint). 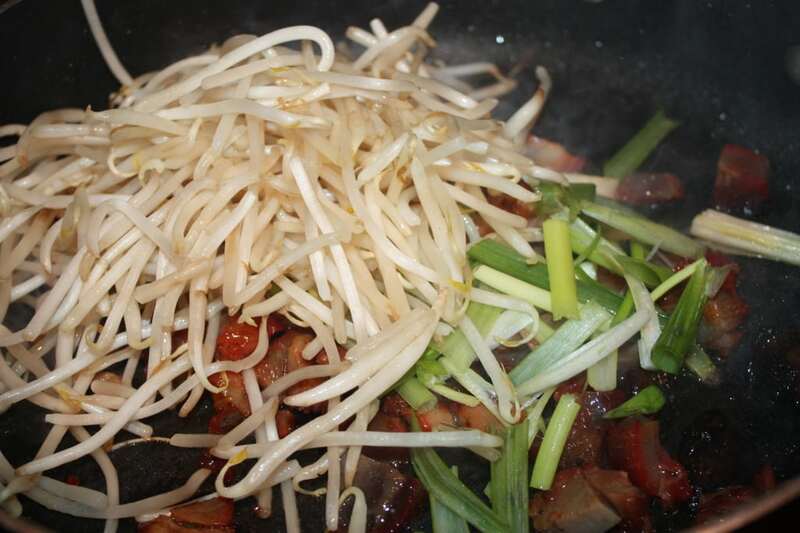 Add the vegetables and cook for about 1 minute, mixing well with the pork and stirring constantly. The green onions should start to get soft. Add the sauce prepared in step 2 above. Cook for another minute. 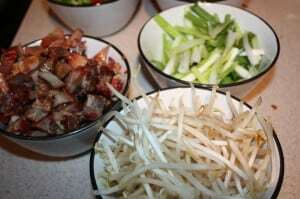 Add the uncooked Pancit noodles. Stir constantly combining the vegetables, sauce and noodles. Cook for about 3-5 minutes on high, continuing to stir constantly, until the noodles have absorbed all the liquid and are starting to get browned. 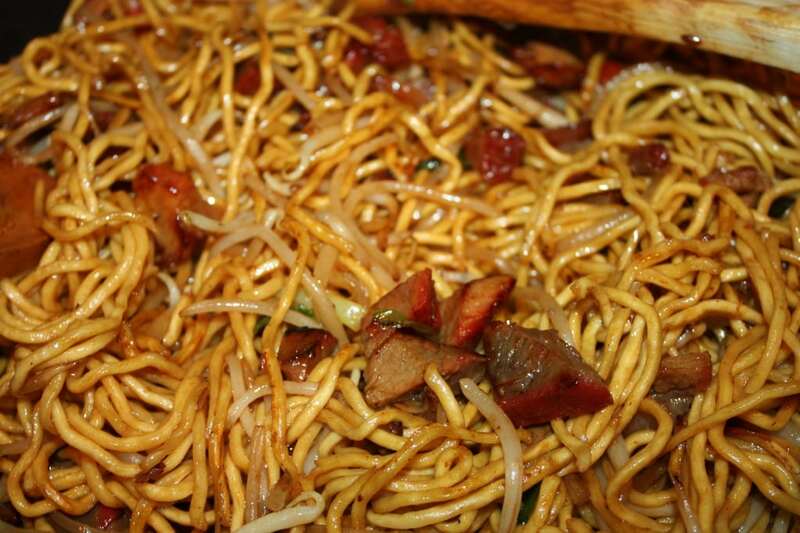 Now, you can choose to brown the noodles completely, but generally I just like them the color you see in this picture. You'll notice a couple noodles are light brown, but they aren't crispy. 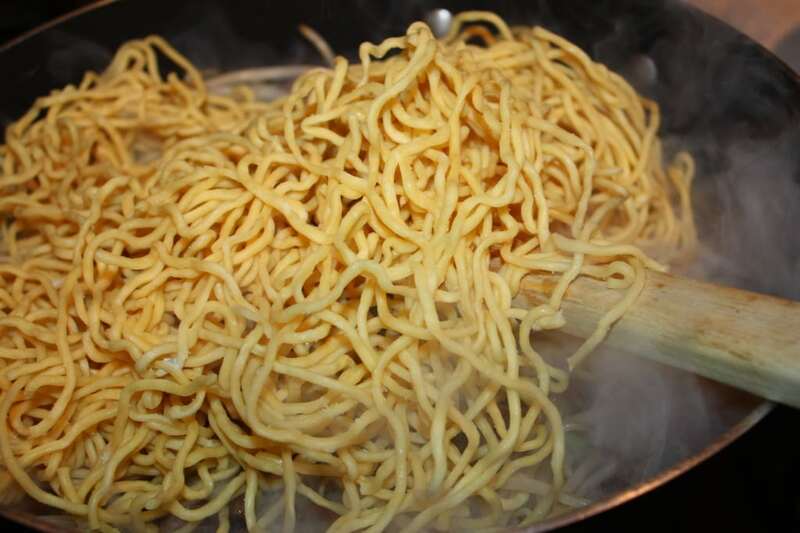 * Picture of Noodles I used. 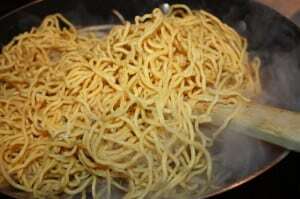 Note that if you are using a dry noodle, you will want to cook the noodles in hot water, removing them when they are al dente. Be sure to rinse with cold water and completely drain before starting. 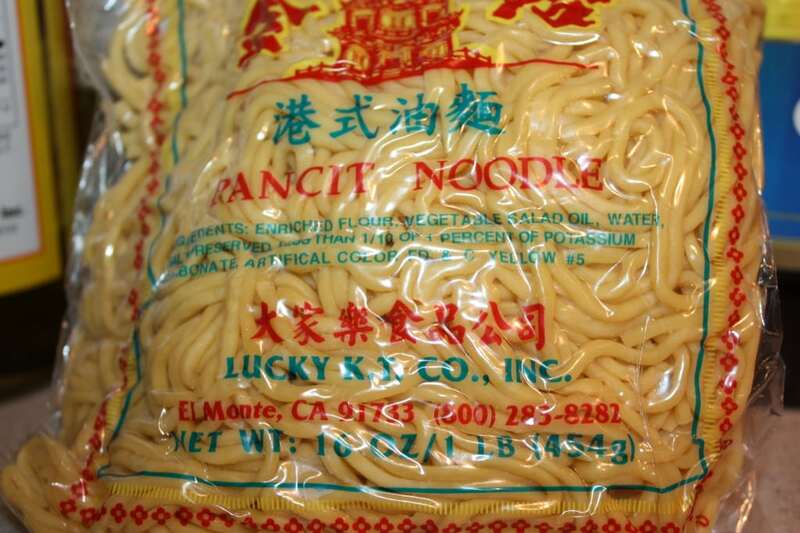 Otherwise, the liquid may make the noodles mushy. 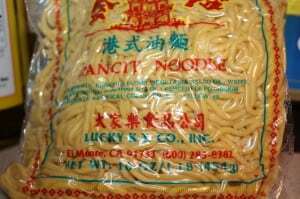 And yes, I know these technically are Filipino noodles, but they are the only good fresh, thick noodles I can find at the Chinese market near me. And they make a delicious chow mein. 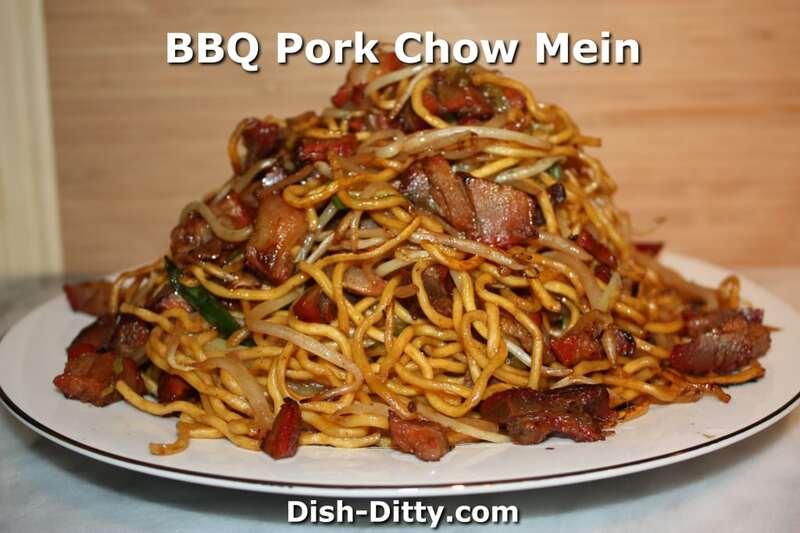 6 Replies to "BBQ Pork Chow Mein Recipe"
I just made this dish and it not only looks great it tastes even better. I am normally a person that changes the recipe based on my opinion and my delusions of being a gourmet chef (I pretend that I am on the food network when I’m trying a new recipe). Since I have had failures when attempting Chinese food (I have one of Martin Yan’s books that my husband had Martin sign at a book signing and gave to me for Christmas. I didn’t point out that a better present would have been to take me to the book signing so that I could have met him, but I didn’t want to sound ungrateful). Anyway, I changed one of the recipes in his book because I didn’t want to drive to China Town and my local Marina Market said that China Town was my best bet for several of the ingredients. The dish tasted okay, but considering the main ingredient was lobster, it was kind of an expensive fail. I decided in the future to follow the directions when trying Chinese food recipes. I ALMOST followed this recipe (sigh, I can’t help it), the only things that I added were minced fresh garlic and ginger. 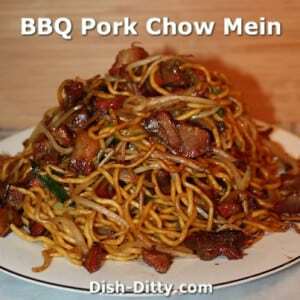 and it is the best bbq pork chow mien that I have had. The fun part about this recipe is that it is easy and doesn’t have a lot of hard to find ingredients, and also gives great advice regarding the noodles, ( I did use the same noodles in the picture). Thank you! Thank you Brenda! That is a great writeup. I am so excited that you liked this dish. If you like garlic in your noodles, you might like this recipe too: http://www.dish-ditty.com/recipe/sesame-garlic-noodles-beef/. Happy cooking! This looks so delicious! What type of pork should I use to make this? Thanks so much for replying, can’t wait to make this for my family!